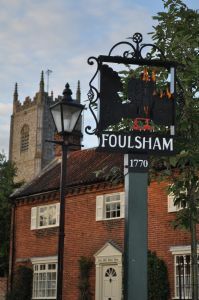 The village of Foulsham is situated north of the A1067 from Norwich to Fakenham. Take the turning opposite the Water Tower signposted Foulsham. This road takes you straight into the main street of the village which is Station Road. The church is situated on the right hand side of the road.